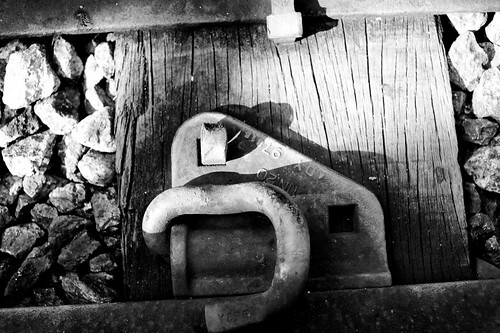 Except that, the story of his life is inextricably entwined with the history of the KTM railway. 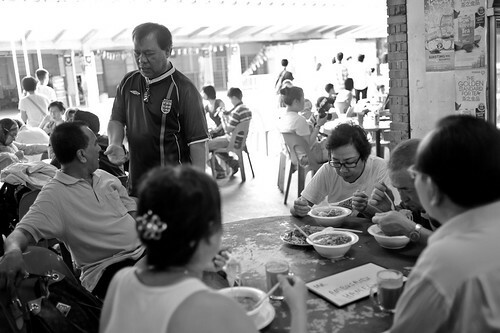 It was difficult communicating with Mr Lee, as he was partially deaf even with the hearing aid, and it was difficult to make out his ramblings in splatters of Cantonese and Malay. 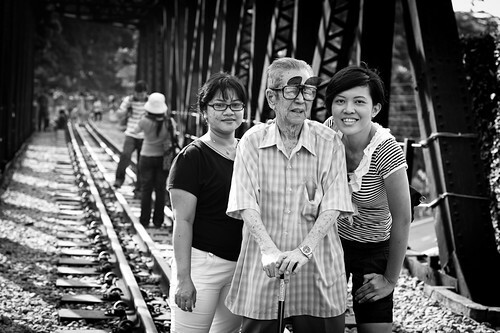 With the help of my friend Jasmine, his granddaughter, and his domestic helper and caretaker, we were able to understand that he had worked the tracks for 18 years. 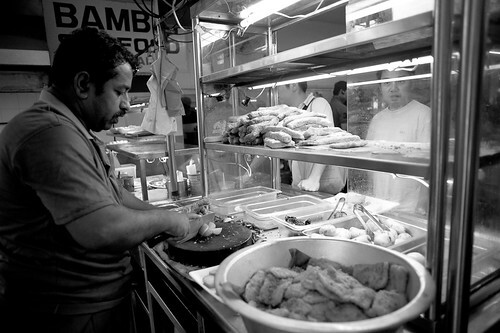 Mr Lee was responsible for laying and aligning the tracks and fixing them whenever needed. 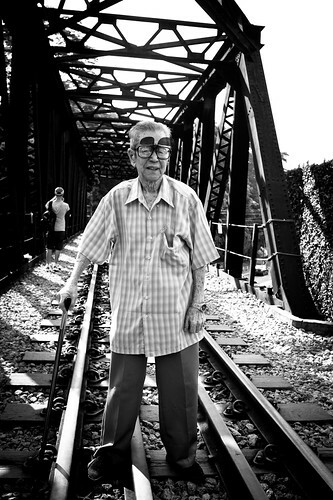 He was one of the Malaysian workers who lived along Spooner Road from 1953 to 1978, who painstaking laid, aligned and maintained the tracks running from Tanjong Pagar KTM railway station. He would get calls in the middle of the night too, about a misaligned portion of the track and he would go down to the tracks to fix the problem, ensuring the safety of the trains running between Singapore and Malaysia. In fact, his hearing problem was a result of the noise stemming from his work. Mr Lee and one of his granddaughter, Jasmine. He had 3 sons and 4 daughters, a total of 7 children he raised while working for KTM. Today, he is still receiving a monthly pension from KTM for his services rendered, though he is now a Singaporean and has stopped working for KTM for more than 30 years. (Which company does that in Singapore?) With his monthly paycheck from KTM, he was able to raise 7 children, 3 sons and 4 daughters. After his retirement from KTM, he became a self taught fortune teller. It was indeed an honor to be able to meet him, someone who toiled at a job few understood or even appreciated, and that was the main reason his granddaughter wanted him to visit the tracks for the last time, before they were returned to Malaysia. We were not sure if Mr Lee fully understood the full implication of what we were telling him, that the entire KTM railway service is now closed. and that the tracks would soon be returned to Malaysia. 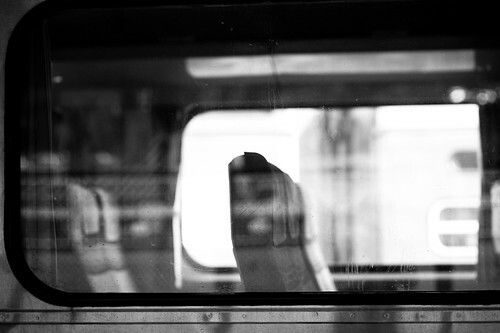 Throughout our trip, he kept hurrying us off the tracks, fearful that a train would come. 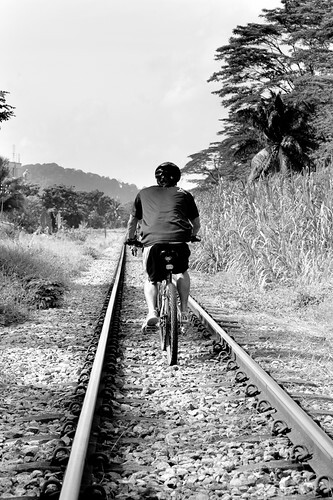 He also thought he was visiting the tracks near Tanjong Pagar even though we were near the Rail Mall. 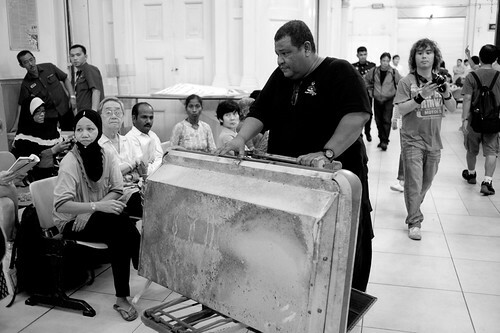 Mr Lee with his domestic help and caretaker of 7 years on his left, and his granddaughter Jasmine on his right. At age 85, and with the KTM service closing, this would probably be his last visit to the tracks. 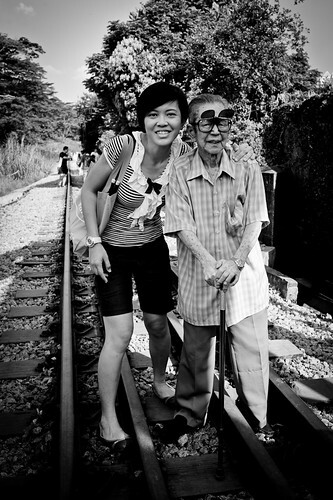 Age has a way of eroding our health, and time, erasing our memories, but for all his complaints about us subjecting him to the tortures of traveling and walking the tracks, when Mr Tan looked at my camera, he smiled broadly, voluntarily, with an unspeakable pride. He may not know where he is exactly, or understand half of what we are trying to tell him, but when we pointed to the tracks, he said yes, he did that. He remembered. 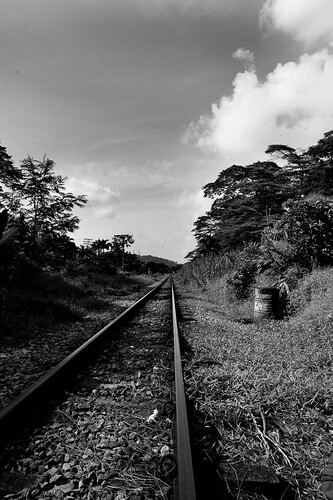 For 79 years, these tracks have borne the weight of KTM trains running between Singapore and Malaysia, and very soon they will be dismantled and the sleepers and metal tracks returned to Malaysia. There is a whole generation of Singaporeans who had not known the existence of these tracks until mention was made of its impending closure. For 79 years, these tracks served quietly and below the radar, faithful in its daily toil without so much as words of appreciation or recognition being conferred on them. The workers of KTM were also largely unrecognised and ignored. How things have changed in just a few weeks. At the departure platform at Tanjong Pagar Railway Station on the last day of the station’s operation. 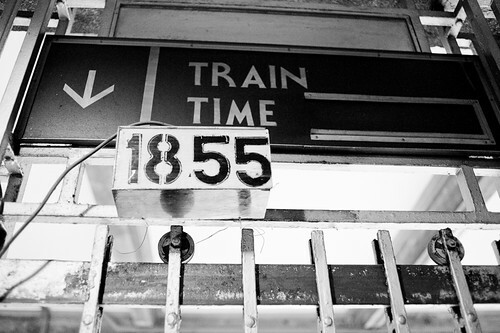 Time has run out for Tanjong Pagar railway station and the KTM railway service. 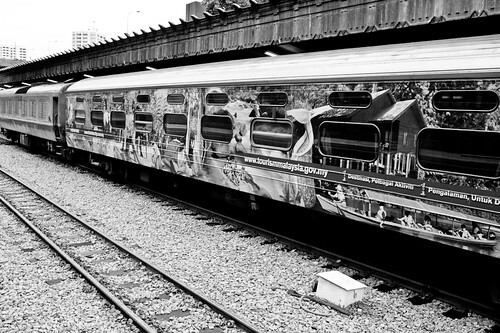 With extreme sadness and heaviness of hearts, the KTM railway service running into Singapore from Woodlands to Tanjong Pagar station ceased with effect from 1st July 2011. 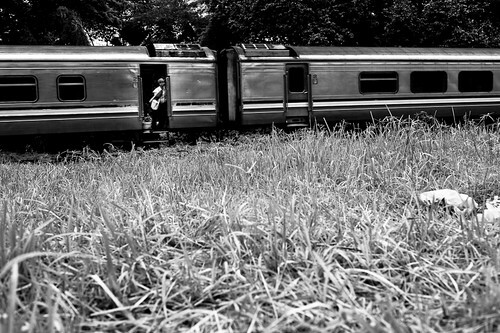 In the historic land swop deal, the land which the tracks run through, previously belonging to Malaysia, was returned back to Singapore, and the tracks became silent when the last train rumbled out of Tanjong Pagar Station, piloted by the Sultan of Johor on the night of the 30th June 2011. Tons of people flocked to the stations and tracks in a last bid to see and appreciate the railway before it was closed down for good. I was there on the last day of Tanjong Pagar station, witnessing the silent teardown of the place. 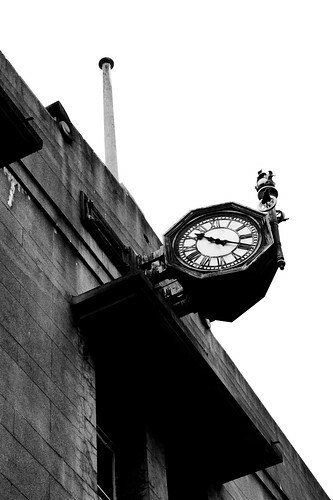 There was no fanfare when the workers came, and with clinical precision, life slowly came to an end at the station. There will be no more next train arriving at Tanjong Pagar Railway Station. 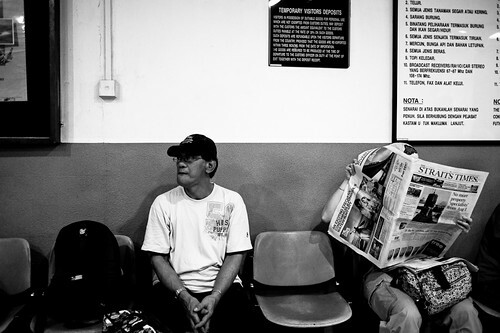 Passengers waiting for one of the last trains out of Singapore. 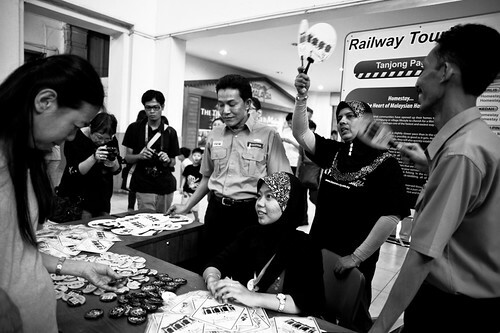 There was still time to setup shop to sell 79 years of Tanjong Pagar railway station in the form of memorabilia and paraphernalia. 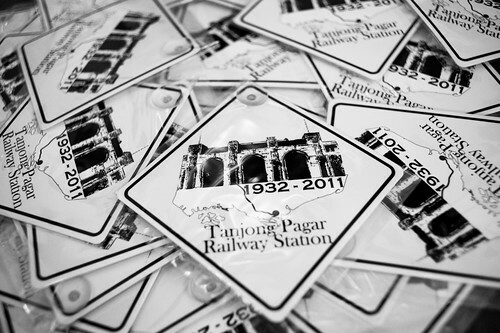 Selling 79 years of Tanjong Pagar railway station in the form of memorabilia and paraphernalia. 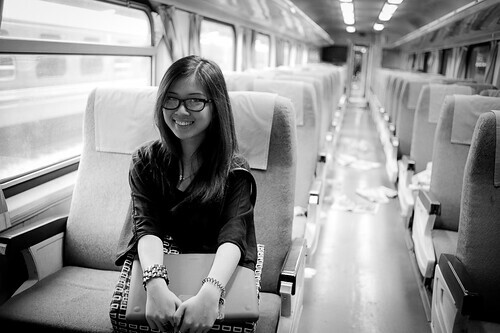 One of my photography students Gwendolyn, who was with me and a few other students, tried to buy tickets for the last train out of Singapore. Alas, she could not get one. 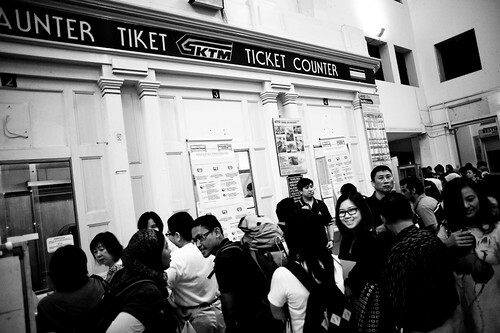 There was much confusion at the ticketing booth as people tried to get confirmation of whether it was still possible to get a ticket for the last train. 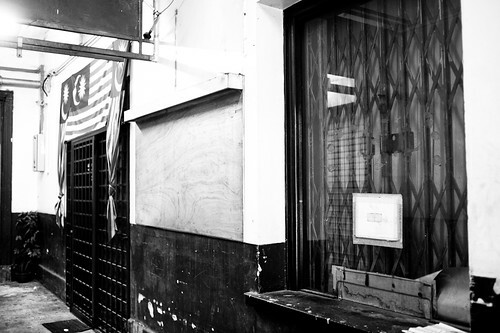 Outside, the dismantling of the coffee shop continued as operations wind down on the last day of Tanjong Pagar Railway Station. 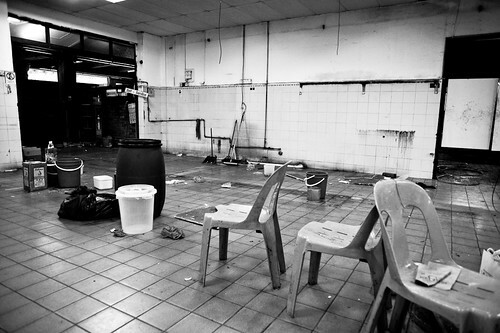 Tables and chairs were kept and probably shipped back on the last day of Tanjong Pagar KTM service. 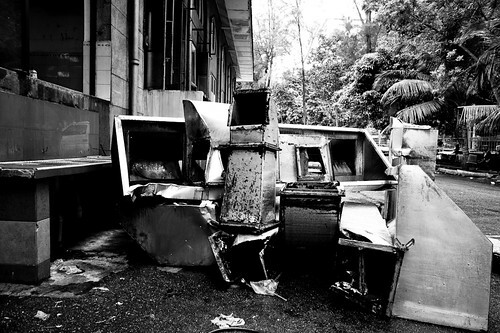 Outside the station, the debris from the dismantling and packing of equipment piled up…. Even the vending machines were not spared as everything that was useful was removed from the station. 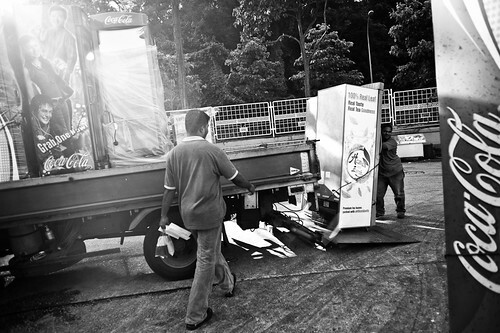 Removal of vending machines from Tanjong Pagar Railway station. There was time for some reminiscing and photo taking before the clock strikes twelve…. Passengers who just disembarked from the train taking photos for memories. 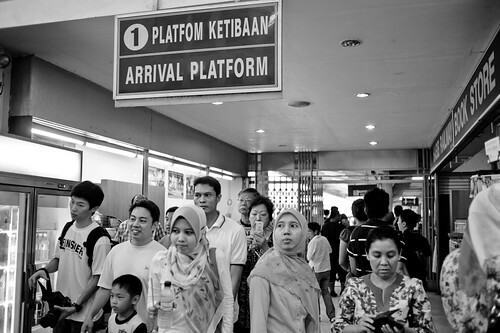 Passengers disembarking from train on the last day of Tanjong Pagar railway station. 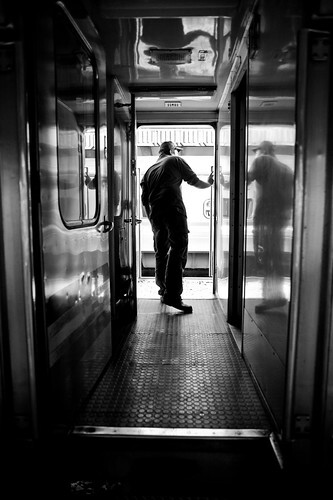 A passenger looks out of the train at Tanjong Pagar Railway station. 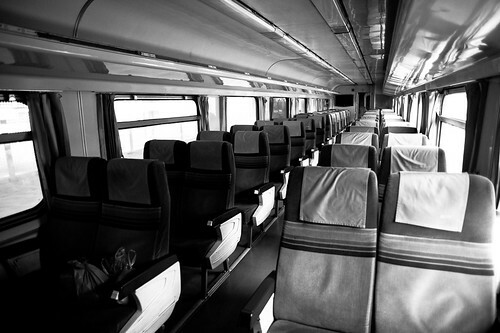 Inside the KTM train – it was not luxurious (this was not the first class cabin) but it has certainly done its fair share of the work carrying passengers between Singapore and Malaysia. Inside a KTM train at Tanjong Pagar Railway Station. Gwendolyn, one of my photography students who visited the station with me on the last day has never taken the KTM train before she visited the station on the last day. A picture seemed mandatory under such circumstances! 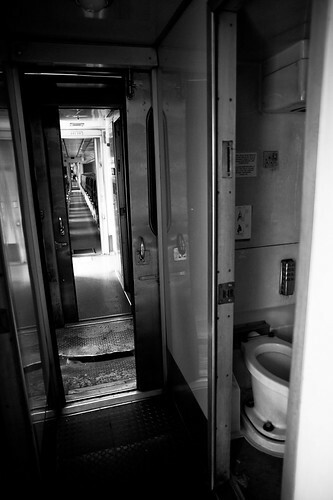 The small lavatory of the KTM train. 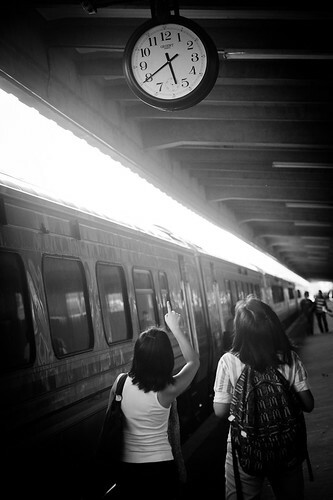 Passengers checking the time at Tanjong Pagar Railway Station. 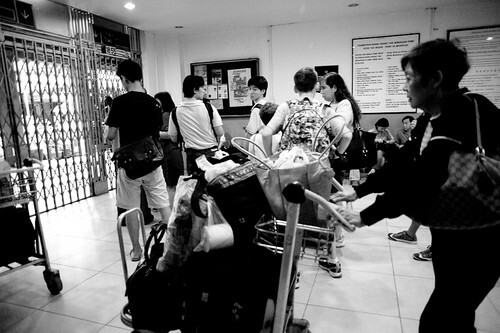 There were hundreds that flocked to the station before it closed on the 31st of July. 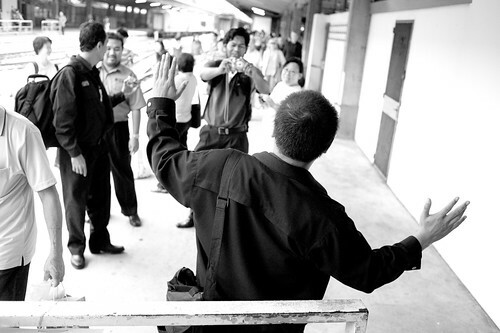 For many of the KTM workers, it was an emotional return to Malaysia after having worked here for so many years. KTM officials milling around the station. 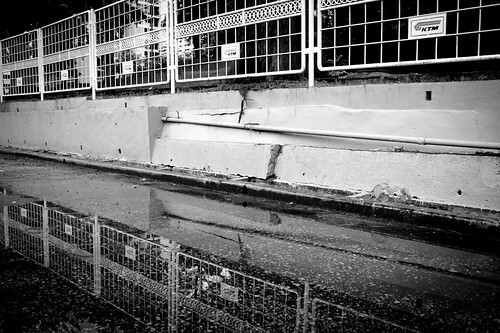 Reflection of the KTM station fence in a puddle of water. There are now no more such scenes – trains stopping at Tanjong Pagar railway station. 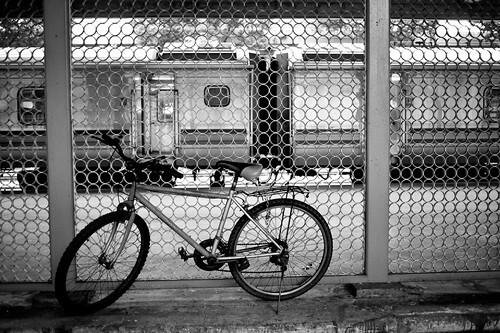 Train parking at Tanjong Pagar railway station. 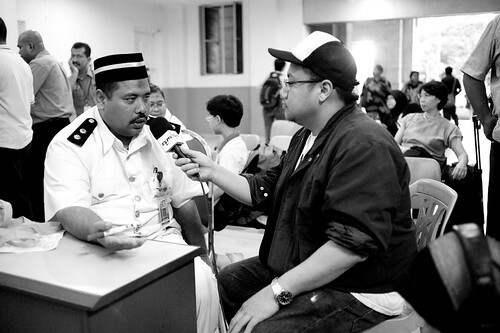 This is one of the last few photos I shot that day – the station master of Tanjong Pagar giving an interview, perhaps the last one inside the station itself. With that, we bid goodbye to the KTM railway service running into Tanjong Pagar. Thanks to KTM for the fond memories of Tanjong Pagar Railway Station! For now, the last chapter on the KTM railway service has been written. This is the last post for this series, but it is certainly not the last word on the Green Corridor, as I will be writing more on the fate of the tracks in future posts. Let’s look forward with optimism and hope that a section of the rail corridor, if not the entire corridor will be preserved!